Many of us humans have been having trouble getting through to our fellow Man on preparedness…So, why not let a pig try to help out. Preparedness Piggy is the official mascot of the Johnson County (Kansas) Emergency Management & Homeland Security Office. He started work last Fall and since then has been a regular at County events. Piggy has also starred in 12 of the County’s video readiness episodes with more in the works. 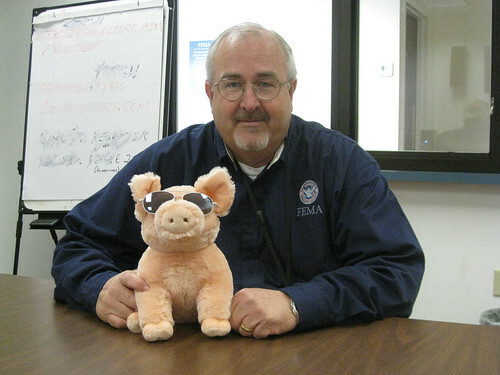 This blog is always on the lookout for creative and fun ways of approaching preparedness; Johnson County’s Piggy fits that bill. One of these preparedness advocates runs FEMA. You can find more information on Preparedness Piggy’s Facebook page (www.facebook.com/preparednesspiggy), the County Emergency Office’s YouTube (www.youtube.com/jocoemergencymgmt), Facebook (www.facebook.com/jocoem) and twitter sites (www.twitter.com/joco_emergency). Preparedness Piggy stars in “That Darn Weather Radio” video. Love the picture of Craig Fugate — he is a good sport about choosing friends to help with the preparedness message. I linked you post to the new Facebook group devoted to Higher Education in Emergency Management.